A versatile 10-100mm power zoom, this lens was developed specifically for shooting movies. The lens features three adjustable zoom speeds to bring coverage variety, plus a voice coil AF motor (VCM) that keeps camera pan-in and pan-out activity silent. Vibration Reduction (VR) reduces the chance of blurred photos. Use this lens to capture everything from portraits to sweeping landscape views. 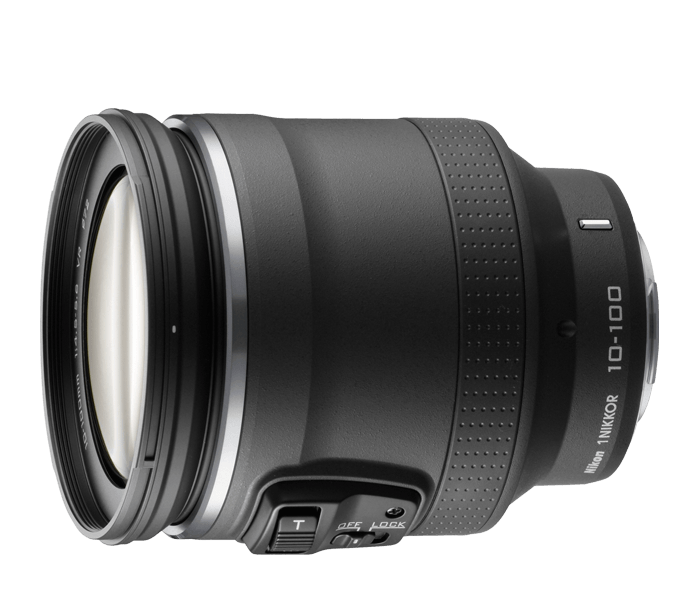 Vary your angles and depth of field with the 10-100mm lens. This lens is equipped with power drive zoom and Vibration Reduction (VR). Also included is the voice coil AF motor (VCM) for quiet autofocusing. Powerful and versatile, your expressions in movie mode will sizzle. Whether working up close with wide view, or framing a horizon in the distance, the 10-100mm lens puts flexibility into your workflow. Command extended depth of field with the 10-100mm and isolate subjects from their backgrounds for both photos and video. Equipped with Vibration Reduction (VR), the 10-100mm is ideal for movie recording, as well as photo capture sharpness. The 10-100mm 1 NIKKOR lens applies three ED and two aspherical lens elements to ensure only the highest quality and color images—even at the widest aperture settings—are obtained. The HRI (High Refractive Index) lens element keeps lens compact while offering superior contrast at even maximum aperture. Use the amazing reach of the 10-100mm and bring subjects close. Get right in the action by maximizing to the full 100mm and retain sharpness at 2.8 feet from your subject. Even at this magnification photos and movies come out crystal clear and sharp courtesy of Vibration Reduction (VR).